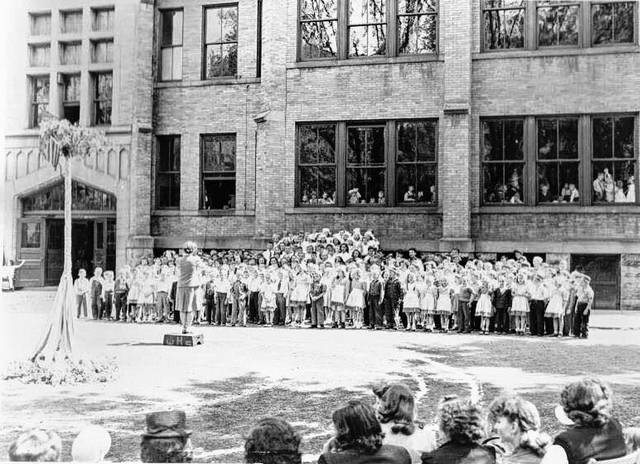 Pictured is a May Day celebration held at the former Boardman Elementary School, which once stood where Boardman Arts Park in now located on West William Street in Delaware. The Northwest Neighborhood Association of Delaware will host Boardman School Remembrance Day from 4:30 to 5:30 p.m. on Tuesday, Sept. 11, at the Boardman Arts Park, 154 W. William St., Delaware. This celebratory and educational event will feature various guest speakers, including Brent Carson (Delaware historian), Linda Diamond (local educator) and others. Attendees are encouraged to bring memorabilia, photos and memories of Boardman School to share. Light refreshments will be served. Roxanne Amidon, president of the NNA, is eager for the community to embrace the rich history of what is now the Boardman Arts Park. The NNA is requesting that attendees RSVP for this free event online at https://www.eventbrite.com/e/boardman-school-remembrance-daytickets-49695355145, so they can ensure there are plenty of refreshments. Attendees are also encouraged to bring their own lawn chairs or a blanket to spread on the grass. Delaware City Schools, with the support of Delaware City Council, has generously given permission to the Northwest Neighborhood Association to test the notion of an Arts Park in the Willis/Boardman Field location for the next two years. During this time, use and receptivity to the park by the community will be studied, and a recommendation about the future of the park will be made to Delaware City Council. Artists from all over the community have been busy working on pieces for the park, and visitors will see the space come to life with color, textures and new additions continuously. The NNA was founded in 2001 by a group of residents and property owners to address civic and legislative issues facing the neighborhood. The neighborhood is bound by the Olentangy River on the east, Euclid Ave on the west, Pennsylvania Ave. on the north and William Street on the south. It is a 501(c)(3) non-profit community association that is committed to preserving the quality of life and fostering a sense of pride in Delaware’s historical northwest neighborhood. The NNA has long used funds collected from annual events (the Ghost Walks and Holiday Home Tours) to fund programs for the neighborhood including banners, planters downtown, Strand Theatre seats, and street trees, among other things. The Northwest Historic District was listed on the National Historic Register in 1996 and includes over 700 contributing structures.